M-Audio has announced version 1.5 of Torq DJ software. New features in Torq 1.5 software include Tempo Anchors, Tempo Master, zplane élastique time stretching, send/receive MIDI clock, a new toolbar and a variety of workflow enhancements. Torq DJ software takes DJs beyond simple beat matching and crossfading by offering a host of real-time creative options. The software's new Tempo Anchors allow users to set the phase grid exactly on the beats of the song, even if the song changes tempo. The new Tempo Master function assigns a playing track to serve as the master BPM for everything in Torq, so looped samples, VST effects and other tempo-based features will follow in perfect sync. These new features are enhanced by the addition of zPlane Elastique time-compression/expansion technology, a powerful new algorithm designed for stretching full music tracks without rhythmic anomalies. As a full-featured virtual workstation, Torq 1.5 software allows performers to incorporate outboard MIDI hardware into their audio production setups. Torq 1.5 software can send and receive MIDI beat clock for total synchronization with drum machines, effects boxes and other computers. Multiple DJs can connect with each other and share the same tempo across systems, which improves collaboration between artists. 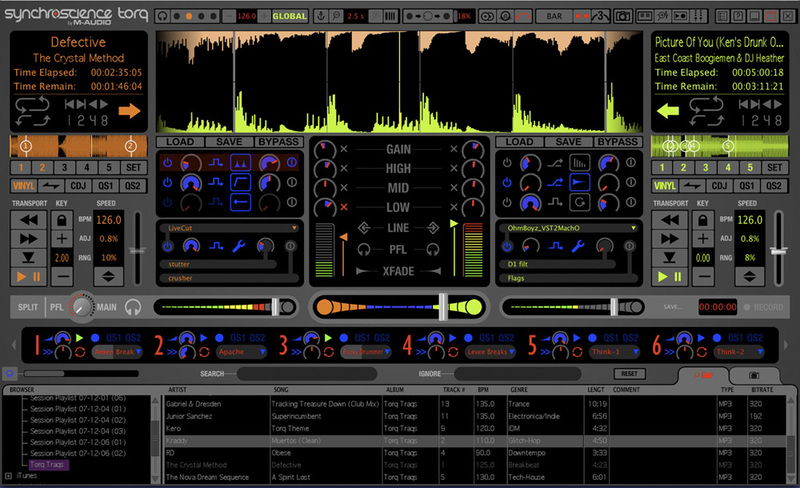 The initial release of Torq software revolutionized digital DJ performance and production by introducing a broad assortment of cutting-edge effects. Torq 1.5 goes even further by adding new features that improve effects processing and inspire creativity. The built-in effects can now be formed into Effects Chains, facilitating greater innovation than ever before. Torq 1.5 also supports VST Tempo so external effects can be automatically synchronized to the playing track. In addition, Torq 1.5 incorporates several refinements to the user interface. The Hide Mixer option conserves screen space by removing the mixer from the user interface and expanding the file browser window. The Browser Preview function allows DJs to preview songs in their headphones before loading them into a deck. Torq 1.5 also displays a warning message when exiting the program or loading a song onto a deck that is already playing in order to prevent accidental set interruption during a live performance. "The initial release of Torq changed the definition of DJ software by combining studio production tools with a robust DJ performance solution, blurring the line between DJs and producers," said Adam Castillo, marketing director at M-Audio. "Torq 1.5 goes even further by delivering a host of innovative new features. With a compatible hardware interface like Conectiv or Xponent, Torq 1.5 DJ software becomes a powerful performance rig that enables DJs and producers to explore new creative directions." Tempo Anchors allow marking tracks with varying tempos—Torq's effects and samples follow the tempo changes in the song. Tempo Master assigns a playing track to serve as the master tempo source for all tempo-related functions. zPlane Elastique time-stretching/compression technology for sophisticated beat matching and pitch alteration. Transmit/receive MIDI beat clock for sync with other hardware/software and easy switching between DJs. Hide Mixer option conserves screen space. Preview songs in headphones before loading to deck. New Toolbar buttons and MIDI/tempo indicators. Skip Protection keeps the music playing even if the Control Vinyl or CD skips. True Key Lock keeps the pitch constant when adjusting external turntable speed. Internal effects can be grouped into Effects Chains. VST effects synchronize with tempo of playing deck. Auto Gain feature matches the gain levels between decks. Additional workflow and interface refinements enhance user experience. Torq 1.5 DJ software is expected to be available for Windows XP-, Windows Vista- and Mac OS X-based systems in the first quarter of 2008. The cost of upgrading from any previous version of Torq is $50. Upgrades will be available online at m-audio.com.